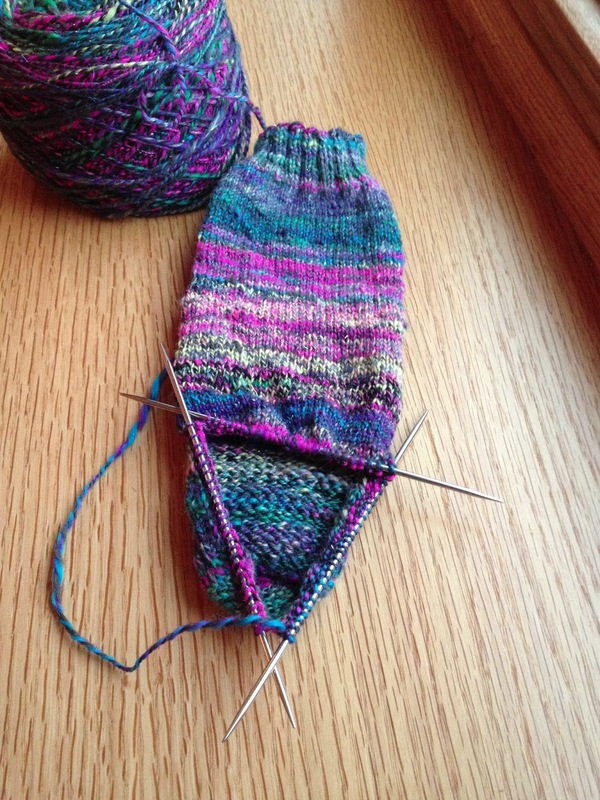 Susan B. Anderson: Sockless in Seattle & The Loopy Ewe Yarn Shop Events! Sockless in Seattle & The Loopy Ewe Yarn Shop Events! I just had to with the title of the post. While in Seattle everyone kept asking me to show them which handknit socks I was wearing and most of the time I wasn't wearing socks so I was Sockless in Seattle. However, I did knit socks in Seattle and while traveling to and from Seattle. I finished another sock (above) in the Opal Vincent Van Gogh series. This one is called, In Variation nach. The thing I love most about the Opal patterned sock yarn is that I don't know how it will look while I am knitting it up. There is a photo on the label of a finished sock but I try not to even look at it before I start knitting so I have that element of surprise. I do look a lot at the Van Gogh painting on the label to see how the colors were incorporated into the sock yarn. It really is quite genius. Click here to purchase Opal Van Gogh sock yarn online at Websters! Then while I am knitting the Opal Sock Yarn and I get into the rhythm of the pattern I always pick a favorite stripe to work toward and it pushes me to keep knitting on. In the In Variation nach colorway, my favorite stripe is that small shot of pink. I finished the Cakewalk Yarn first sock. The pattern is the Simple Skyp free pattern on Ravelry. Skyp refers to slip, knit, yarn over, pass the slipped stitch over. It is quite a simple and fun pattern. I think the yarn colorway is called Hero Squad and I have had it for a long time now. It is really beautiful with the flecks of color. Rose, the dyer, is a real talent. Paula of the Knitting Pipeline suggested combining this pattern and the Cakewalk Yarn and she is right. It's the perfect match. Click here for the free Skyp socks pattern! I turned the heel on my handspun sock! It's really pretty. 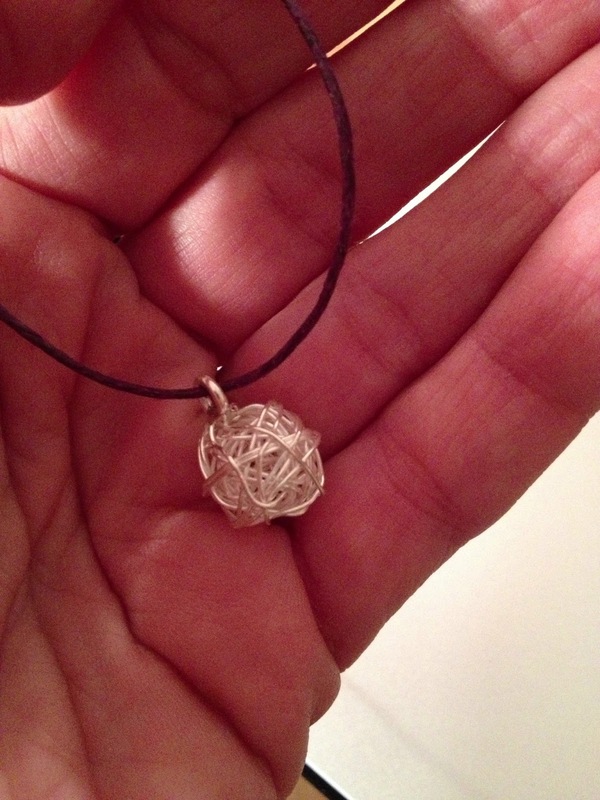 I got my next package from the Knitcircus Sparkle Yarn Club and it included yarn, a shawl pattern and a beautiful wire yarn ball necklace made by Amy Detjen. I wore it all day. Thank you Amy and Jaala! Apparently Amy Detjen does make and sell these necklaces if you are interested. You can contact her on Facebook or Twitter! I have the second socks started for both the Opal and the Cakewalk Yarn socks. I have a lot of work knitting coming up so they may have to wait a bit. On the other hand, socks are my favorite travel project and I have a lot of that coming up as well. Next week I am off to beautiful Colorado. On Wednesday evening, April 17th I am teaching my Fair Isle Hat class at the lovely Loopy Ewe. Click here for the address and phone number for the Loopy Ewe. I have no idea if the class is full or not. On Thursday, April 18th, I will be at the Loopy Ewe shop all morning for a book signing and meet and greet that is open to the public/stoppers-by/anyone in the area. My new book, Topsy-Turvy Inside-Out Knit Toys, will be available for purchase at the shop and I will be signing new and old books alike. I will have the trunk show of toys from the new book with me as well. Then starting April 18-20 I will be teaching four more workshops including the Fair Isle Hat class and my new Build-a-Toy class, at the Loopy Ewe Spring Fling retreat. I believe this event is full at this time. I hope to see many of you there if you are able! I'll try to remember to wear my handknit socks so I don't disappoint. I put this link on my Facebook, too, but it is so funny and worth mentioning here. Check out the tumbler page entitled, Reasons My Son is Crying (click here). Anyone who has ever taken care of young children will have a laugh and will easily relate. You're going to make me pick up sock knitting again! Haven't done socks in a long long time and I think I did for up(?). When you are doing cuff down, How do you gauge how much yarn you have left? That Tumbler site...can't stop laughing...! Terrific socks off the needles. I miss vanilla sock knitting. It's so soothing. Should I or shouldn't I is what I'm wondering...how can I justify it. Only for on-the-go? I saw your new book at Foyle's in London. Just tried to say 'loopy ewe' too many times and my tongue hurts now... Those are lovely socks though. Have you thought about knitting your socks two at a time? I started out on double points, but now I knit them two at a time on two circulars. I doesn't seem to take more time to knit a pair of socks that way than it does to knit a single on DPNs. (I think Abraham Lincoln was still in his first term back when I started knitting socks. . .) And your Opal socks are gorgeous. The sock bug has bitten me lately and your post is inspiring me to cast on for a new pair :) I so enjoy popping in here to see what new things you are working on! Good luck with your classes this week!